Weirdest moment of the weekend: I was sitting on a bench in my front lawn listening to 10,000 Maniacs and getting angry at Natalie Merchant for not performing Because The Night with the orchestra behind her at Bass Hall two years ago. Then two guys get out of their car and walk up to me, point at the Senior In The House's car, and ask, "You want to sell that?" How hard does the Texas Supreme Court -- full of twittering judges -- work? October 2nd: No opinions issued and no new cases granted to be heard. September 25th: Same. September 18th: Two boilerplate decisions. No new cases granted to be heard. September 11th: No opinions issued, and no new cases granted to be heard. And the number of majority opinions written by Justice Willett over the last calendar year: 4. Salary excluding benefits, health care and pension: $168,000. Ads disguised: On Friday, The Ticket's Hardline spent a weird amount of time on a "Supper Club". 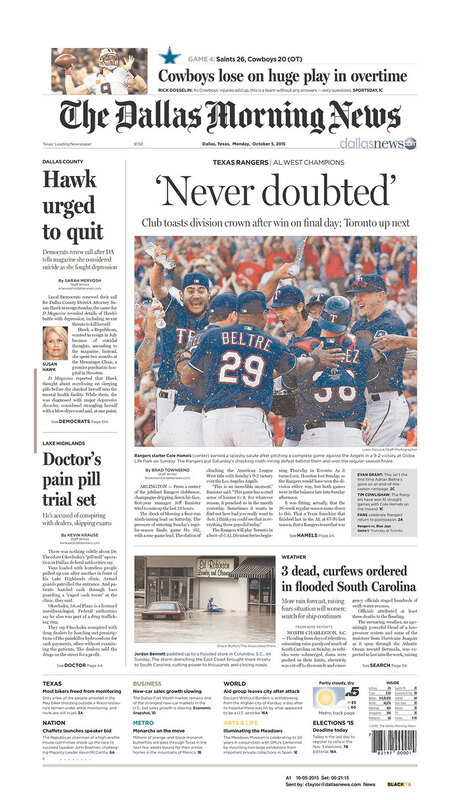 Over the weekend, the Dallas Morning News did the same. So how do I know it is a paid ad? This line from the DMN story: "The second dinner on Oct. 15 will feature six courses from Joel Orsini, sous chef at CBD Provisions in downtown Dallas. The $95 per person dinner is already sold out, but the guest list is always open [and here was a hyperlink I deleted where you could go to pay]". Ummkay. If you consider that the The Ticket and the DMN are in a partnership, that Cumulus and Belo are bleeding money, you will have your answer. Interesting comments on Friday when I said I wouldn't listen to Dennis Prager on "relationship advice" since he's on his third marriage. Some said should a person not listen to drug addiction advice from someone who was once a drug addict? Sure they should. But I would only listen to him if he openly admitted being a past drug addict. Prager never admits to past failures at relationships. That's what makes him a simpleton and/or a con man. Sports: (1) Was that the lowest moment in UT football history being down 30 points in the first quarter to TCU? (2) I remember an article once about UT beating of TCU in 1974 by a score of 81-16 as "They Day TCU Football Died". I looked up the box score of that game this weekend and noticed that UT had total yardage 334. So how did Texas score 81 points? I finally saw it: TCU had 7 turnovers. 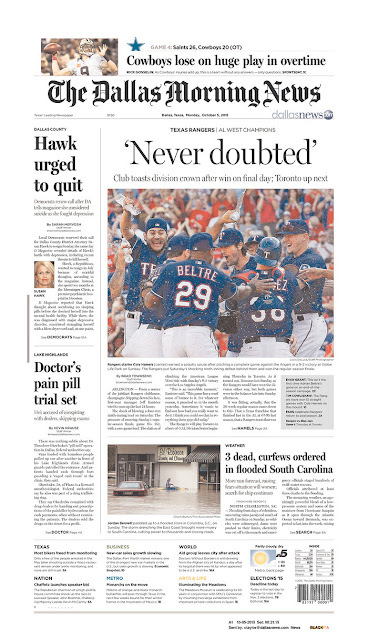 (3) Who would buy a "Western Division Champions" t-shirt even if you were a big Rangers fan? Do you think an Alabama fan would buy an "SEC West Champion" t-shirt? (4) I'm not saying Baylor will win the National Championship, but I am saying this is the best chance they will ever have to do so for the rest of my life. (5) DFW television ratings from yesterday: Cowboys, 37.3, Packer game, 12.8, Giants game, 9.8, and critical Rangers game, 6.0. I had a weird dream involving a 10 foot rope thin snake that had wings by its head. Pretty creepy. GQ magazine long read: "The Untold Story Of The Texas Biker Gang Shootout".